A chalk mural contest, karaoke, chili cook-off, free rides from Uber Eddie and more have the Southern Illinois University Edwardsville campus abuzz as students celebrate 2016 Homecoming, Monday, Sept. 26-Sunday, Oct. 2. “Students look forward to homecoming every year,” said Dylan Stanley, graduate assistant in the Kimmel Student Involvement Center. “We’re nearing the midway point in the semester so all of these exciting activities serve as great stress relievers. This year’s theme is Back to the E. Students will have some time travel fun during a costume contest and screening of Back to the Future in the Meridian Ballroom, and will give a nod to the 80’s during a dance competition, golf cart parade and chalk mural contest. Registration is available for the Alumni Hall of Fame banquet being held Friday, Sept. 30, the SIUE Cougars Unleashed: Homecoming Run and Pancake Breakfast scheduled for Saturday, Oct. 1, and the Alumni Pregame Tailgate at 4 p.m. on Saturday, Oct. 1 at Korte Stadium, ahead of the SIUE Men’s Soccer match against Drake. 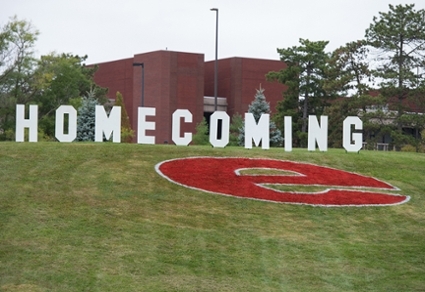 For a complete schedule of events and to register, visit siue.edu/homecoming/events.